Ships from Manufacturer. Allow Several Days. Baked Fresh in a Local Amish Country Bakery! 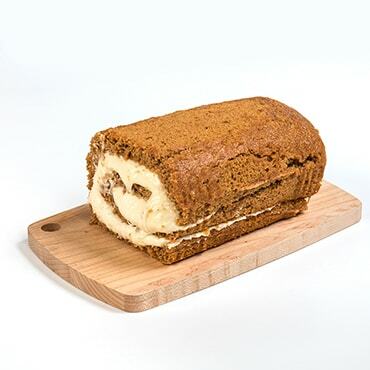 If you like pumpkin treats, you'll LOVE our pumpkin cake roll. It's super moist with layers of pumpkin and rich, sweet cream cheese filling - a seasonal favorite! 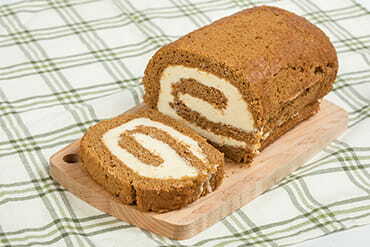 Note: Our yummy pumpkin roll will arrive in an insulated cooler; refrigerate immediately. It can only be shipped to a physical address (sorry - no P.O. boxes). Cannot be expedited or shipped outside of the U.S. If shipping to AK or HI, additional shipping charges will apply. Please call 1-800-438-5346 for more information. Ingredients: Cream Cheese, Powdered Sugar (sugar, cornstarch), Sugar, Pumpkin, (100% pure, canned) Eggs, Flour (cake flour, white, enriched), Shortening (vegetable oil blend (partially hydrogenated soybean and palm oil), water, contains less than 2% of salt, mono and diglycerides, nonfat dry milk, soy lecithin, sodium benzoate (as preservative), artificial flavor, artificial color (beta carotene), vitamin A, palmitate), Vanilla Extract, Cinnamon, Baking Powder, Salt, Nutmeg. Note: Produced in a facility and on equipment that also processes Milk, Eggs, Wheat, Peanuts, Tree Nuts, Soybeans, Fish and Shellfish. Arrives in an insulated cooler; refrigerate immediately. It can only be shipped to a physical address (sorry - no P.O. boxes). Cannot be expedited or shipped outside of the U.S. If shipping to AK or HI, additional shipping charges will apply. Please call 1-800-438-5346 for more information.